Today I was going to share a story called “I Love You,” about the first time Jacob said those words to me. But, I found this book this morning in my parent’s garage and I have to share it. It couldn’t be a more perfect precursor to the “I Love You” story, because this is an “I Like You” story. Every family has their “thing”. Whether it’s an obscure movie you watch every Christmas or a word made up by one of the kids when they were 3, each family has things they say or do that is only understood in the context of that family. I can think of about 30 things my family has like this, including, but definitely not limited to, our use of the word “Yolo” as a confession (far before You Only Live Once ever existed), the fact that 90% of our conversations take place in an accent of some type (the favorite being Sid the Sloth’s voice), and our deep-rooted love for movies like Little Women, Emma, and Ever After (boys of the family included). One of our “things” is a little book called “I Like You” by Sandol Stoddard Warburg. I grew up thinking that everyone knew what this book was and everyone’s parents read it to them on a regular basis. No? You’ve never heard of it? Well, let me share this sweet little book with you. One of my favorite parts of this book is the tattered pages, taped-together cover, and hand-written note from my dad to my mom on Christmas Day 4 years after they were married. 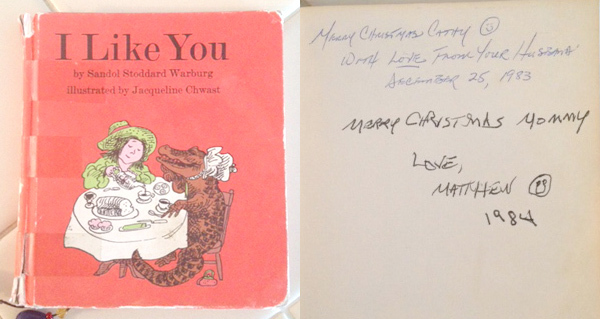 One year after he gave it to her, my older brother Matt gave the same book to her. Re-gifting at its finest. Too late, it’s a quarter past silly!